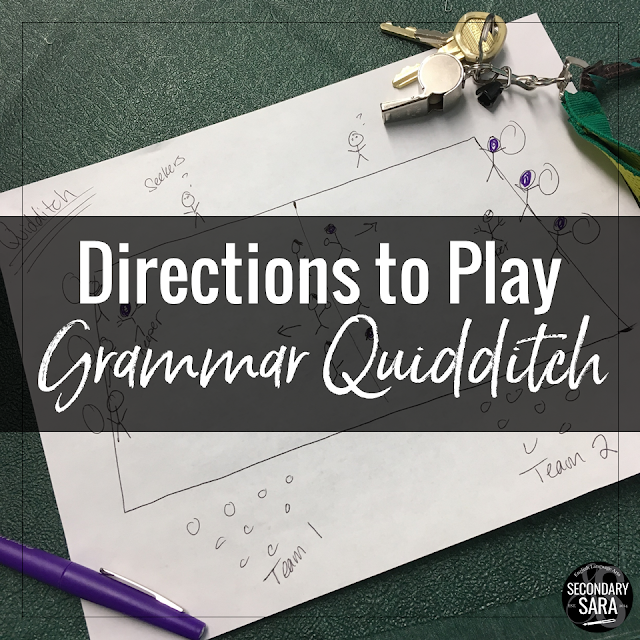 I was desperate for a better way to teach grammar. 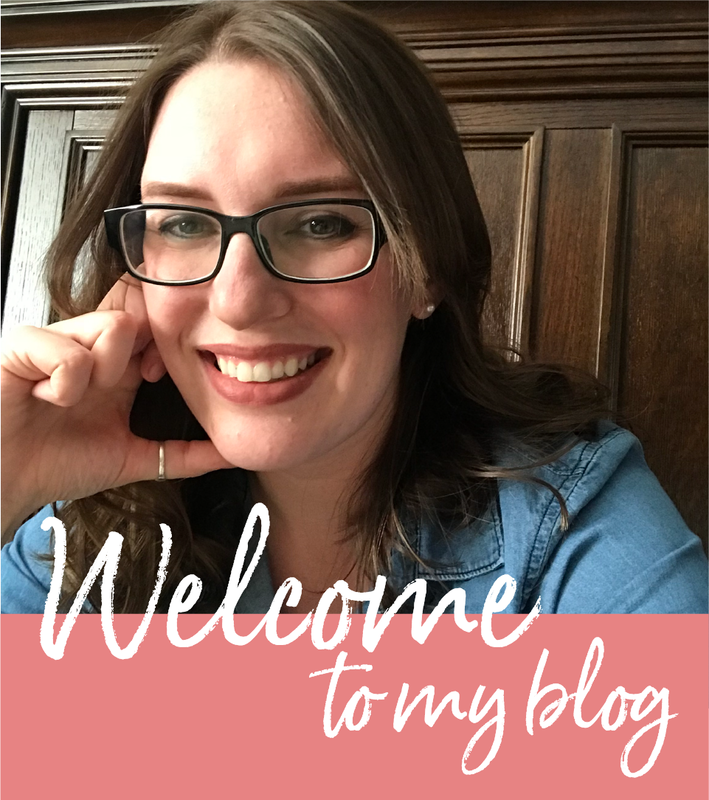 On my end, I was overwhelmed with how much I needed to teach: how to get it all done and how to do so logically. For my students, I was concerned about their engagement (not tuning out or getting bored) AND how to ensure that they "got it". These worries are particularly valid if you KNOW your students have knowledge gaps, are going to need a LOT of practice, or aren't doing well with transferring knowledge into their writing. 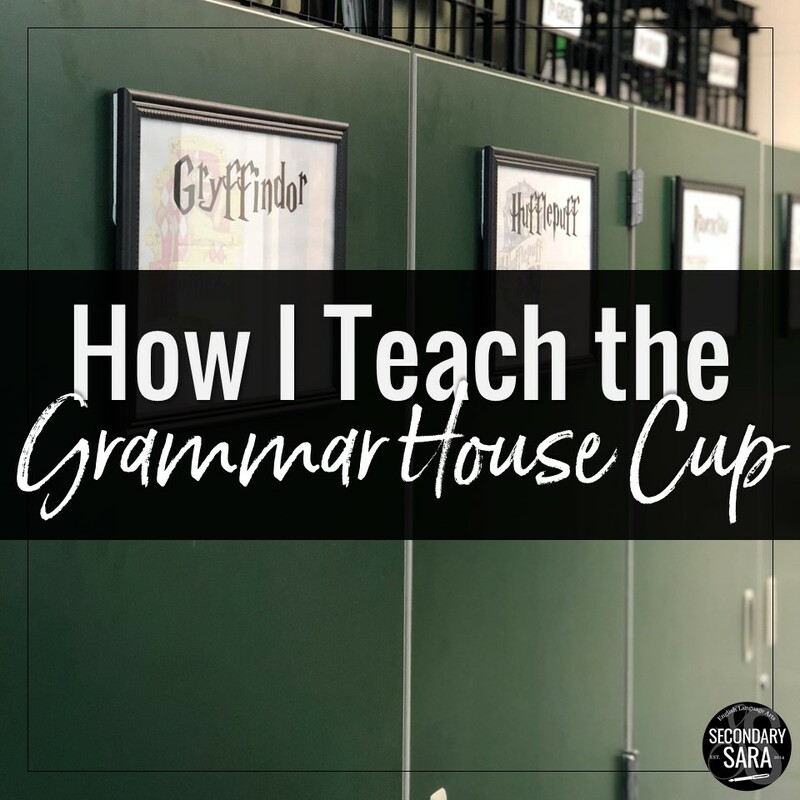 The idea for the GHC came partially from the "Grammar Olympics", a competition that I witnessed in another high school while student teaching. I decided to go with the Harry Potter theme instead and built my own game board system that differed from the Olympics' structure. More students going "above and beyond" the minimum because they're motivated to earn points for their houses. We have 4 houses of students (just like in Hogwarts). Students earn points for their house throughout the year, and whichever house has the most points at the end of the fourth quarter (end of the year) wins. Students earn points by completing tasks in the game board (see below). 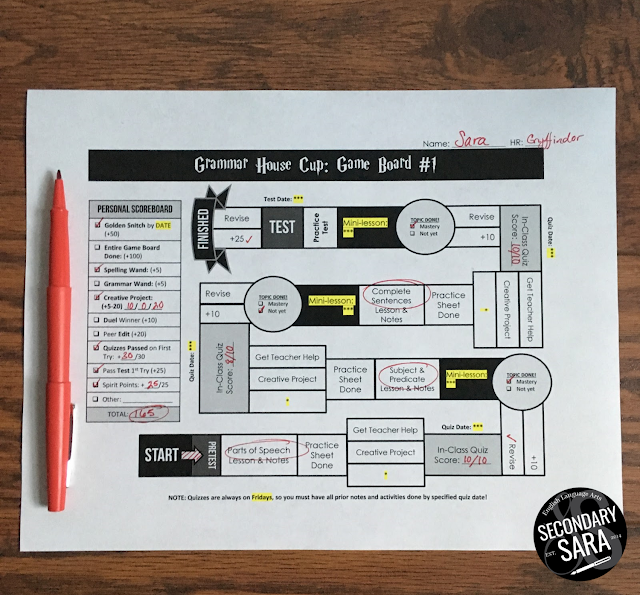 Sometimes the points are connected to an assessment (such as passing a quiz on the first try), and some point opportunities are directly within a student's control (such as doing more practice than is assigned). The biggest prize/motivator is bragging rights. We have an actual trophy, and the winning house/homeroom gets their homeroom name and year added to the trophy (AND gets to keep the trophy in their homeroom the following year). I have also given donuts or food to the winning house. Fortunately, we've been doing the GHC for enough years now that incoming 7th graders are looking forward to it, so that adds to the motivation as well. Students independently attempt a practice page after the guided notes. CHOICE practice: Before the quiz, students can get teacher help, do independent practice on IXL (a program we have), or do a "creative project". In-class quiz (after which they either get points for passing OR are required to do "quiz corrections" and show improved mastery). Closer to the test, students complete a practice test as homework (to review), and we go over the practice test answers in class. Students take the quarter test over the 3-4 topics, after which they get points or do corrections (just like they did for quizzes). Completing the game board EARLY (working ahead and not procrastinating). We call this reward "catching the golden snitch". It's important to note that a house's points are NOT directly connected to grades. ...However, students who earn more points DO tend to perform better on quizzes and tests, because they were earning points by LEARNING. So while GHC "points" and grades are correlated, the points have more to do with effort and participation. I know a sorting hat might have been more fun, but the positive of doing it by homeroom is that it promotes homeroom unity and enthusiasm; it also motivates the homeroom teachers to care about and support the GHC. Prepping this quarter's game board (and all of its respective lesson videos, guided notes, practice sheets, etc.). I organize it all in Google Drive and share a folder to students. When we begin in the first quarter, there is usually a diagnostic test (see above), and I have to do a lot of explaining of how the game works. However, students learn by doing as we go through the motions of the first topic, and then they learn the routine. At the end of each quarter, I verify each student's points, collect all the totals, and update the scoreboard for each house. 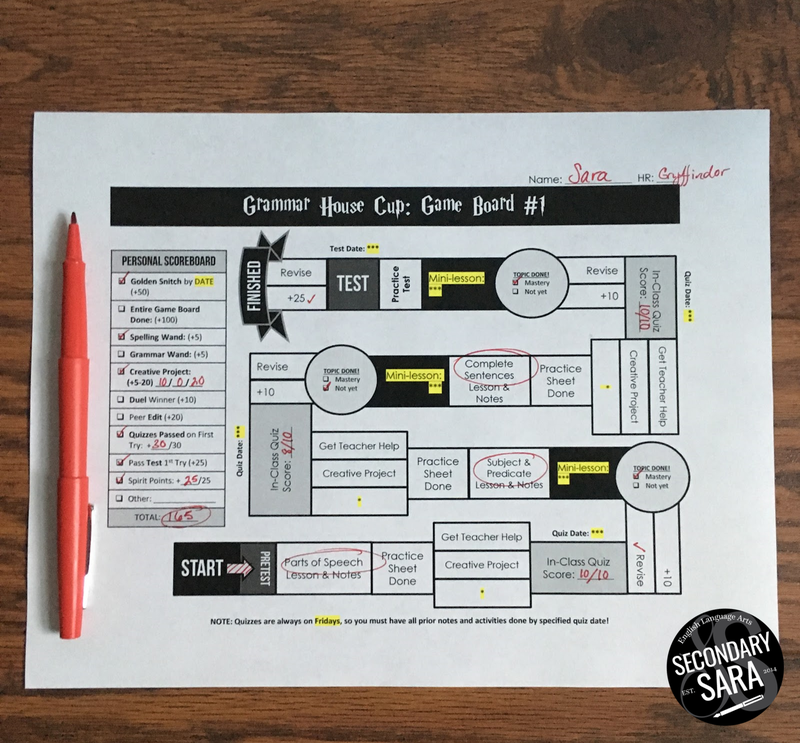 As I mentioned earlier, I plan to use the digital game board instead of a paper one, and I also plan to use these free Grammar Stations before each topic's quiz. 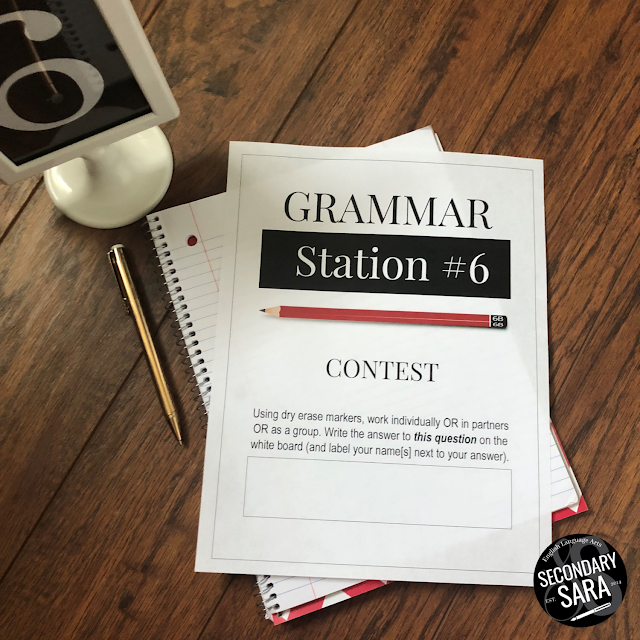 I'm hoping the stations will help ME pinpoint student struggles in a small group format AND give students more practice time with all the resources I've made available to them. 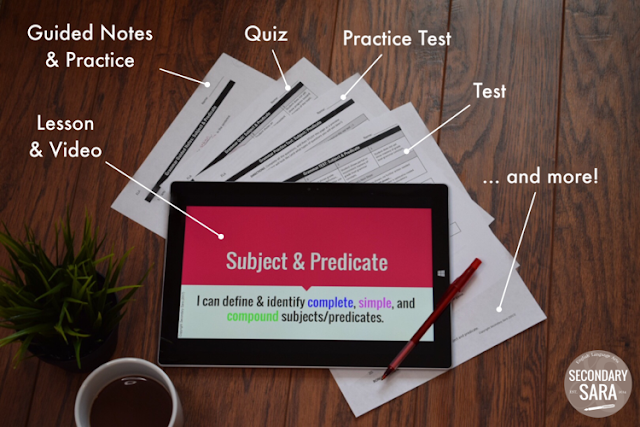 I will also be experimenting more with self-grading quizzes when possible (using Google Forms). I will try to update this blog post later in the year. 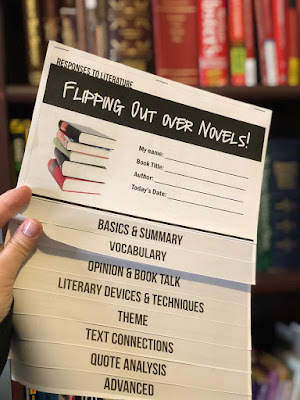 There is SOME intentional overlap in 7th and 8th grade topics (especially when we are reviewing at the beginning of 8th grade), BUT there are some topics that only 8th graders get (such as verbals, verb moods, and active/passive voice, which are CCSS for 8th grade and not 7th). 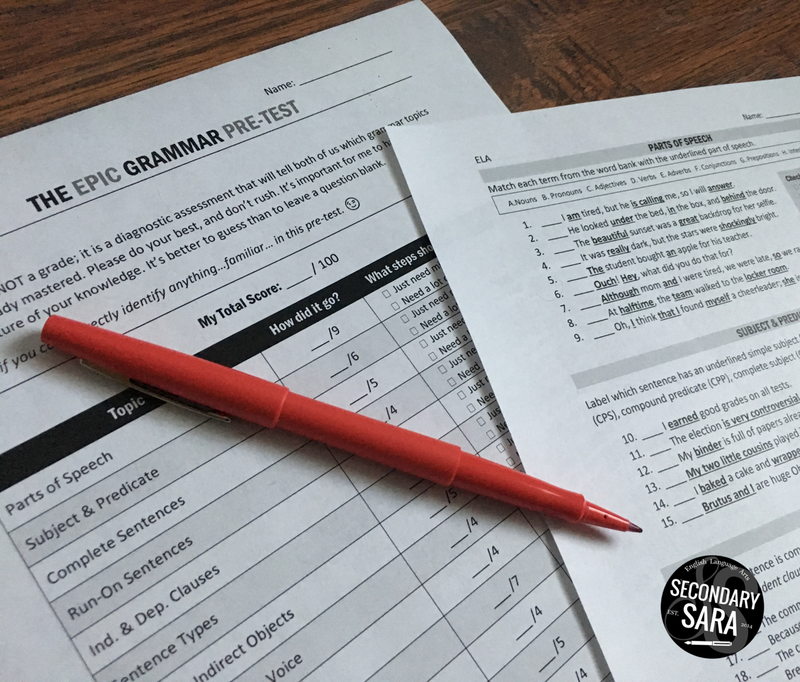 See my complete/current list of grammar topics here. Can I have all of your lessons, Sara? Yes! You can get all of my grammar topics (or just some of them) in my TpT store. 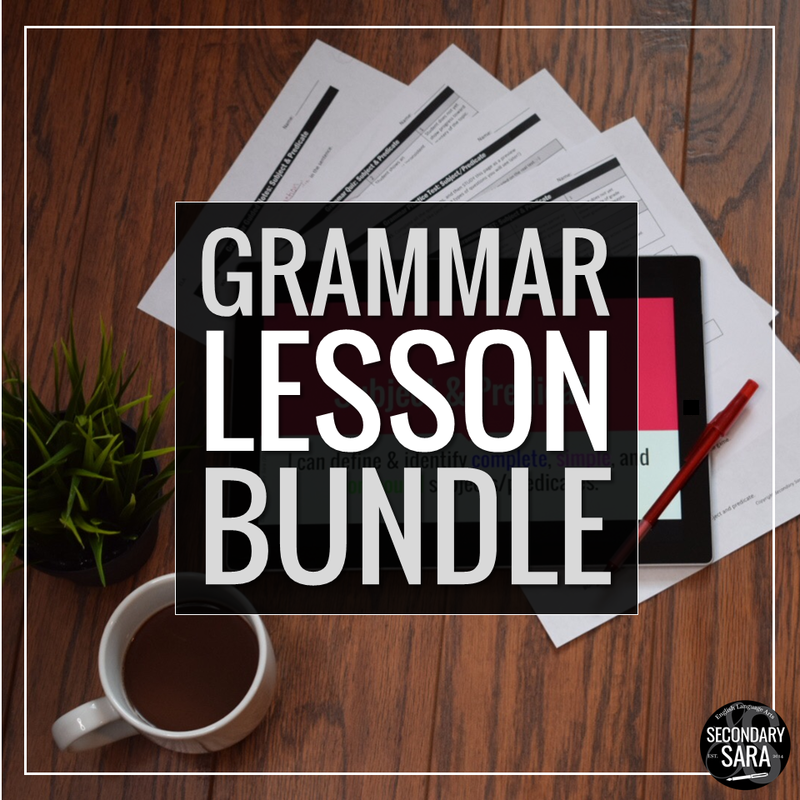 The bundle includes game boards, all lessons/quizzes/tests, the diagnostic test, stations, premade Quizlet sets, and more! I love everything about this plan! I love how the students get to control many aspects of their learning, and I really love how it fosters a sense of family in your classrooms! This is so amazing!